This book is your gateway to a new adventure! 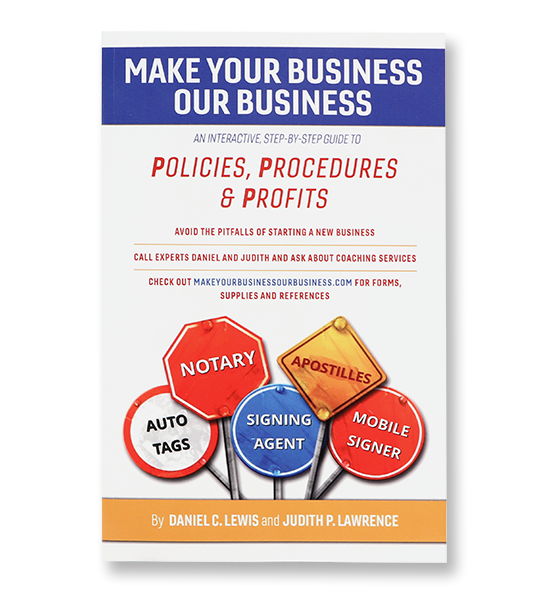 Written by two successful Notaries, this book is a manual for those who want to be a Notary entrepreneur. 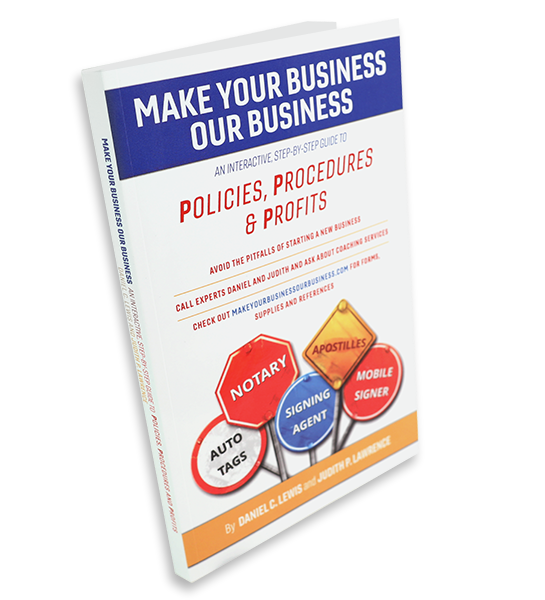 Whether you are just starting your Notary business, or you are a seasoned Notary Signing Agent, using this book properly can have an enormous, positive impact on building and maintaining a successful Notary business. The profession of the Notary Public has changed over the years. It has evolved from being Notary Public employees working in a bank or insurance company, to becoming independent contractors, proctors for exams, insurance inspectors, and Notary signing agents. The industry has over 4.5 million Notary Publics, with only a fraction of them knowing the true power and value of the office. Whether you are just starting your Notary business, or you are a seasoned Notary Signing Agent, the wisdom and experience shared in Make Your Business Our Business will provide the tools to help you think bigger with more positive changes in your work life. It will give you large ideas and tools to help you get you out of your own way and achieve success. It will make you stop and think about how you could operate your business better. Written by two successful Notaries from two different areas of the country and with different backgrounds, you will gain from their different and equally valuable perspectives on the Notary industry.